On a gorgeous Sunday morning following the Anderson Valley Pinot Noir Festival Grand Tasting, I drove the circuitous Philo Greenwood Road west from Philo. Dotted with towering redwoods and with little sign of life, I finally emerged 15 miles later into a clearing where an apple orchard was perched on a knoll with sweeping views of the countryside extending to the Pacific Ocean. I felt like the gates of heaven had opened and I had entered paradise. Jason and Molly Drew felt this way as well when they first came upon this property renowned for growing “Greenwood Gold” apples. 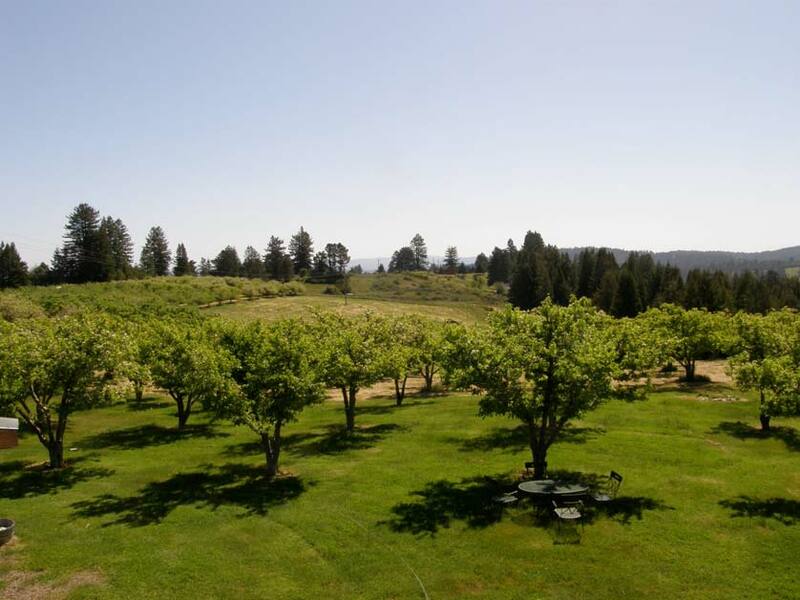 In 2004, they had been searching the North coast for an appropriate location for vineyards and a winery and as fate would have it, this was the first property the real estate agent in Elk showed them. They moved in with their family (two boys) and lived in a trailer until the winery and their upstairs home was completed. As I viewed the orchard from the upper deck of the winery building, Jason pointed out the perfect exposures that are slated to be developed into vineyards. He spoke with reverence about the land and I could sense his heart-felt appreciation and gratefulness for his destiny in finding this special spot of earth. Located in the only incongruous appellation in California known as Mendocino Ridge, this newly discovered region just north of the Sonoma Coast just might be the next haven for California Pinot Noir. The photo below shows the future initial vineyard site in the distance and the shaded table where I sat down with Jason and talked. Since 2005, Jason’s wines have drawn my attention as well as many well-deserved accolades from the wine press. 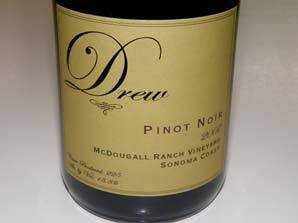 Last year, Drew was chosen as one of the Wineries of the Year by Wine & Spirits magazine. He is a gifted artisan producer of wine and drawing from grape sources as diverse as Sta. 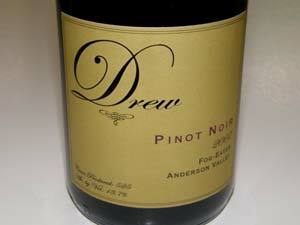 Rita Hills, Sonoma Coast and Anderson Valley, he consistently produces Pinot Noirs that show great purity of fruit, balance and structure to predict age ability. His wines are sold largely through an eager mailing list of devotees with limited retail distribution. I would recommend you join the list to obtain these limited production gems for this is a star in the making. 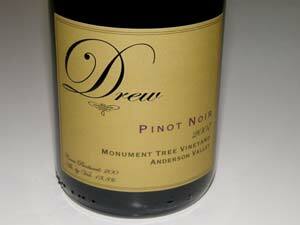 I tasted through the entire 2007 lineup of six Drew Pinot Noirs. There will be no Savoy Vineyard bottling in 2008. 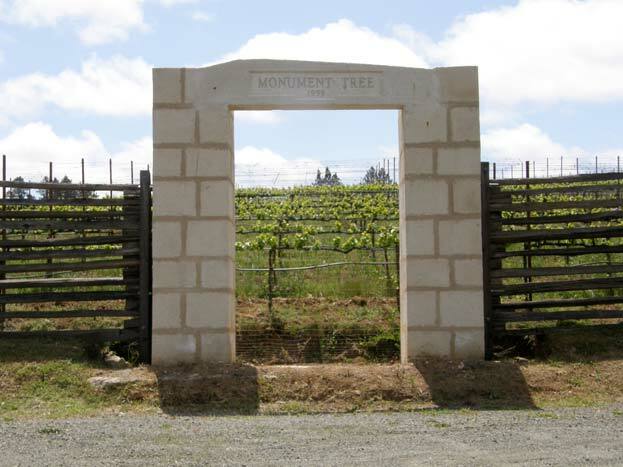 Jason will be adding the Manchester Ridge Vineyard to his lineup in 2009. Jason also crafts cool climate Syrah from the Anderson Valley (Valenti Vineyard and Broken Leg Vineyard) and Manchester Ridge (Perli Vineyard Potato Patch). All the wines are sensibly priced ($40-$50) considering the quality of the vineyard sources and the impeccable winemaking. 13.8% lc., 426 cases, $42. 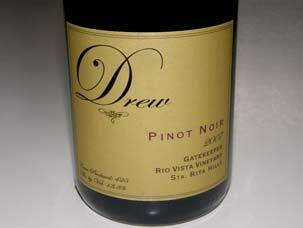 Sourced entirely from Rio Vista Vineyard located on the southeastern side of the Sta. Rita Hills AVA. Jason has worked with the same blocks from this vineyard since 2002. Average Brix at harvest 24.7º. Yields 2-3 tons per acre. Clones are 50% 777, 25% 667, and 25% 115. High density plantings dating to 1998. 10% whole cluster fermentation, 30% stem inclusion, 8-day cold soak, 21 days on skins. Aged 11 months in 30% new and 70% seasoned French oak barrels. · Expressive aromas of cherries, cedar, pine and mint. 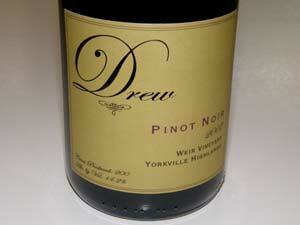 Delicious cherry and red plum with an appealing earthiness. Very smooth and elegant, nicely spiced, with soft tannins and a finish that lures you back for more. 13.8% alc., 200 cases, $42. 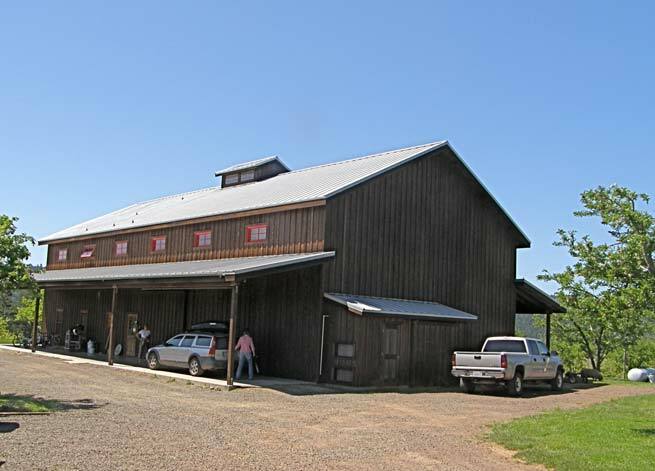 This vineyard is located in the deep-end of the Anderson Valley in Philo. 15 acres planted to Dijon clones 114, 115 and 667 in 1999. Charles McBride is the owner. Yields were 2.4 tons per acre. Brix at harvest was 24.5º. 15% whole cluster fermentation, 30% stem inclusion, 7-day cold soak and 20 days on skins. Aged for 11 months in 30% new and 70% seasoned French oak barrels. · Moderately deep reddish-purple color. On the nose there are slightly confected red plums and berries, forest pine and cedar with a hint of camphor and spice, becoming more floral with time in the glass. Woodsy and earthy red berry fruit with a supporting dusting of oak. Beautifully composed with fine tannins, a spark of acidity and a soft and clean finish. Builds in momentum in the glass and keeps getting better and better. Like a well-perfumed and adorned debutante, this wine is a charmer. Tasted twice with consistent results. 13.7% alc., 495 cases, $42. Fog-eater is a regional boontling term used by the early settlers of the Anderson Valley to denote a coastal dweller or someone living out on the margin. 60% Balo Vineyard (Dijon clone 828 and Martini selection) and 40% Valenti Vineyard (Dijon clone 667). Yields were 1.25-1.95 tons per acre. Brix at harvest 23.5º-24.2º. 15% whole cluster, 20% stem retention, 8-day cold soak, gravity racked twice, aged for 11 months in 30% new and 70% seasoned French oak barrels. · Expressive and enticing aromas of black cherries, cedar and forest floor.This wine speaks of its forested terroir with cherry fruit flavors enhanced with wooded forest and juniper berry flavors, moderate tannins and lively acidity. Still outgoing the next day from a previously opened and recorked bottle signifying age ability. 14.2% alc., 200 cases, $42. This vineyard sits in a cool pocket among the redwoods at the southeastern border of the Anderson Valley. Situated on a steep southeastern slope at 850 feet, the soils consist of shale and clay. The vineyard was planted in 1992-1998 and is about 15 acres in size and contains rare heritage clones of Pinot Noir. For this bottling, four clones were combined: 2A, Pommard 4, DRC selection and Rochioli Riverblock selection planted in 1992. 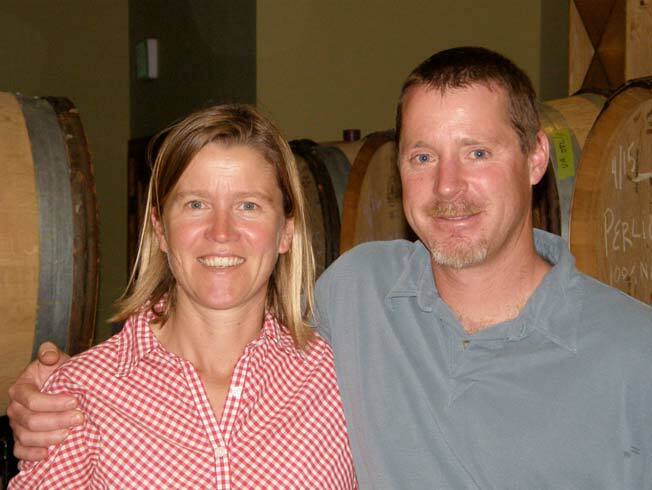 The owner, Bill Weir, is a Burgundy fanatic and has strived to produce old world character in his north coast vineyard. I have had some stunning Pinot Noirs from this vineyard! Yields were 1.88 tons per acre. Average Brix at harvest 24.2º. 15% stem inclusion, 4-day cold soak, 15 days on skins. Aged 11 months in 30% new and 70% seasoned French oak barrels. · A complete wine of great interest beginning with scents of dark fruits, cedar and middle eastern spices. Dark plums and berries assault the palate with intensity. A big-boned bruiser but not jammy. Flamboyant tannins balanced nicely with tangy acidity. The black knight in the lineup that Jason has managed to corral. Needs short ribs. Drank perfectly fine the next day from a previously opened re-corked bottle indicating a long life ahead for this wine. 13.9% alc., 225 cases, $45. This meticulously farmed vineyard is located in the cooler reaches of the Anderson Valley near the town of Philo. Planted in 1992-1998, the clones are Pommard, Calera, and Dijon 113, 114, and 115. Yields were 1-1.8 tons per acre. Brix at harvest was 24.5º. 30% whole cluster fermentation, 30% stem inclusion, 7-day cold soak, 14 days on skins, aging for 11 months in 30% new and 70% seasoned French oak barrels. · Rather shy nose exhibiting aromas of red fruits, wet stone, minerals, wood and spearmint. 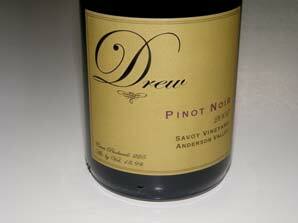 Light and restrained for a Savoy Vineyard Pinot Noir, with pleasant cherry, cranberry and strawberry flavors. Notable tannin and brisk acidity. Decent but not a revelation. 13.8% alc., 225 cases, $50. From a small 7-acre vineyard planted to clone 114 in 1998 in a highly coveted area known as the “golden triangle.” It sits on a small bench 1,300 feet elevation about 2.5 miles from the Pacific Ocean on a steep south slope in the true Sonoma Coast. Brix at harvest 24.5º. Yields 2.1 tons per acre. 20% stem inclusion, 8-day cold soak, 18 days on skins, aged 11 months in 30% new and 70% seasoned French oak barrels. · The seductive nose sports bright fresh berries, cardamon spice, violets and Chanel #5. Sweet red fruits saturate the palate with a faint touch of oak. A comforting drink that is smooth and ethereal in the mouth with everything singing in harmony. Still great the next day. Full-on seduction. 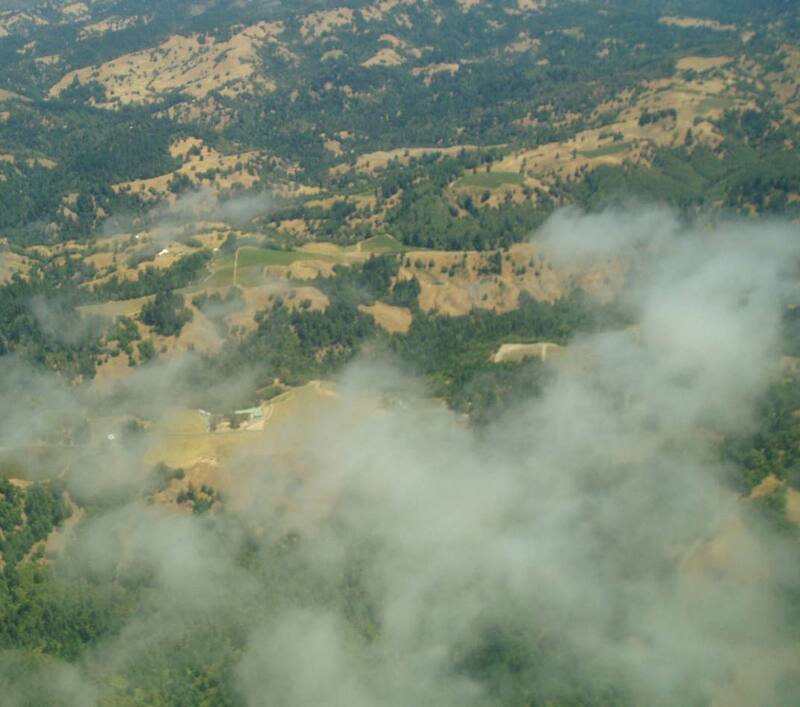 An aerial photo of McDougall Ranch Vineyard below (small vineyard just right of center).